Within this stay, you will discover snowmobiling but you will also enjoy all the attractions of Quebec ! 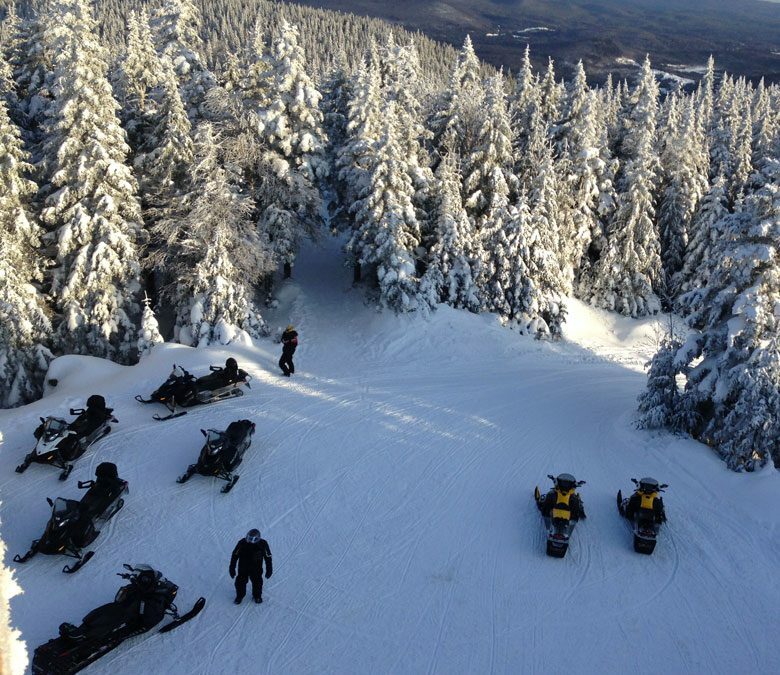 On your snowmobile, you will see the most beautiful Laurentides’s and Lanaudière’s winter landscapes. Golden Gate Bridge and Montagne Noire are the strong points of this ride, but the Ouareau shelter’s panorama, the crossing of the Lac des Îles, the suspension bridge and also the walk around the lake will also let you with lasting memories. Every night you will come back to the chalet and spend the evening in front of a warming fireplace. To relax and end this stay, you will enjoy half of the day in a spa center. You will also discover our beautiful nature by dog sledding. Of course, you will have the pleasure to lead your own dogteam with your guide’s advice. We will welcome you at the airport and drive you to your accommodation. upon arrival, after welcome drinks, we will introduce you with the week’s program. Then you can make yourself comfortable at your inn and enjoy a good meal. After breakfast, we drive to our center located in Sainte-Marguerite-du-Lac-Masson. After filing some formalities, we will distribute your snowmobile equipment. Your guide will provide driving tips and safety rules. Then departure for your first day of snowmobiling on the federated tracks of Quebec. Dinner and overnight at the inn. After a hearty breakfast your guide will have you discover St Côme’s village. In winter, this charming little village of the Lanaudière region hosts an ice sculpture competition. If your reservation has been made during this competition time, you will enjoy seeing the artists working. Dinner and overnight at the inn. You will begin a journey towards the wild and steep landscape of the Montagne Noire. There, the trees are named “mummies” because they are wrapped in a mixture of snow and ice. You will notice many wild animal tracks. At the top of the mountain, if you are lucky, some Quebec grey jays will come to peck in your hand. Dinner and overnight at the inn. You will live a great day made of discoveries. In the morning, your guide will initiate you to ice fishing, and for the lunch you will eat what you caught ! In the afternoon, you will become a musher, driving your own dogteam. Use this free morning to get fresh air and go snowshoeing. In the afternoon you will relax at the spa, between jacuzzi, steam room and sauna… calm and rest is important ! There is nothing better after all these adventures. You have the possibility to enjoy massages on request. At the end of the day, we drive you to Montreal. Night in a downtown hotel. Free dinner. Take this last day to visit this beautiful city, from old Montreal to the Mont Royal plateau , and underground shopping mall. Don’t forget to buy maple syrup ! At the end of the afternoon, you will head to the airport to board your returning flight. It is a lovely inn composed of bedrooms with double bed and private or shared bathroom. You will relax in front of the fireplace in the living room. For every stay of three days or more, we offer a group discount starting from 4 people !